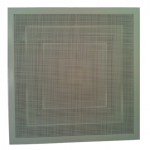 TITUS Model TDCP perforated diffusers are designed for both supply air and return air purpose HVAC system, which handles a wide range of horizontal airflows to the requirements of design engineers. These are specially designed which also giving pleasing appearance to suit architectural needs to flush outlets and concealed fixing methods. Titus Model DL drum louvers are especially useful where long throws are required. This requirement occurs in installations where the conditioned space is large, making it impractical to bring the ductwork close to the occupants. The Titus OMNI diffuser satisfies architectural as well as engineering criteria. Its strong, clean, unobtrusive lines harmonize with the ceiling system, without sacrificing performance. TITUS spigot ceiling diffusers are designed for both supply air and return air purpose HVAC system, which handles a wide range of horizontal airflows to the requirements of design engineers. The T3SQ works in heating/cooling applications. The curvature of the backpan works with the formed edges of the face panel to deliver a tight horizontal air pattern without excessive noise or pressure drop over the full range of operation. As the volume of air is decreased by the control disc, the velocity of air is increased, thus maintaining the longest throw and best entrainment. This ensures superior performance at all damper positions.